One day tour to the Ribeira Sacra and the Sil Canyon, departure from Ourense. It includes a boat trip, cultural visits and wine tasting. - One day excursion around the Ribeira Sacra. The tour of The Sil river Canyon is the first tour offered by Excursion Ribeira Sacra, with regular departures from the citiy of Ourense. In this organized tour you will visit the most renowned places of the south side (province of Ourense) of the Ribeira Sacra. Departure from Ourense train station after picking up customers at the bus stop of San Lazaro park, at the city center of Ourense. After completing the check-in of all passengers, we will head to the Monastery of San Pedro de Rocas, the oldest monastery in Galicia (Spain), with most of its church carved directly in rock. After visiting the monastery, we will head to the pier of Santo Estevo to start the boat trip on the Sil River. During the navigation you will cross the Sil Canyon (the most abrupt area of the Ribeira Sacra), where you will be able to see terraces of vineyards located in areas of great slope, being one of the most representative images of the viticultura heroica (harvest of heroes) in that region. 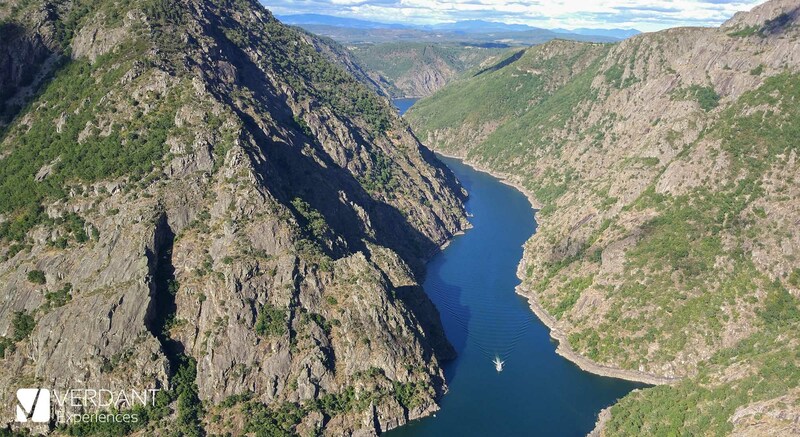 Once the boat trip is finished, we will continue the excursion and on our way to Parada de Sil we will have time to visit a Sil Canyon viewpoint, we will stop at Cabezoas viewpoint, one of the most famous viewpoints in the Ribeira Sacra. We will continue to a village called Parada de Sil, with several restaurants where we will have a 1h 20min break for lunch, and regain strength before continuing our tour through the Ribeira Sacra. Note: lunch is not included in the tour price, unless you request it during the reservation process. Afterwards we will to visit the Monastery of Santa Cristina de Ribas de Sil, hidden among Chestnut trees and located in the slopes of the Sil Canyon, is one of the symbols of the Ribeira Sacra and one of the best examples of the Galician romanesque architecture. Note: if for logistics constraints we cannot visit Santa Cristina, we will head to the village of Castro Caldelas, listed as one of the most beaufitul villages in Spain. Over there, we will visit the Castle of the Condes de Lemos. After visiting this monument, we will head again to the riverside of Rio Sil where we will enjoy the incredible scenery that you can be seen from the Peña de Matacás viewpoint. From there you will be able to observe the vineyards located in the slopes of the riverbanks. To end the day we will stop at the village of A Abeleda, where we will visit the winery "Adega Vella". In this winery the will explain us the whole wine making process, and also we will taste some of their wines. After saying goodbye to the Ribeira Sacra, we will head back to Ourense and drop our customers off at their departure points. Info: it might be possible that some tours are done in the opposite order of visits, for operational reasons. IMPORTANT: departures times are very strict, the tour won't wait for customers that show up late. We recommend you to arrive 10 minutes before to the departure point. Approximate duration: 10h30min from Ourense. Language: Spanish / English (other languages please contact us). Included: Transportation by Bus, Boat trip, Visits and Tickets, Visit to winery and wine tasting, Travel Insurance. Not included: anything not mentioned in included. Ticket: you will need to print or show the receipt that you receive in your email to join the tour. If you get dizzy easily, it is recommended that you take some medication for sickness because the roads in the area have many curves. There are not many places where you can go to the restroom, try to go when instructed by the guide. The tour will take place as long as we have a group of at least 10 people, in other case the tour can be canceled by notifying with at least 5 days in advance. If it gets cancelled we will offer the possibility of making the trip on another available date, or in other case the refund of the amounts that have been paid. We will stop in Parada de Sil, a village where you will find several restaurants (it is recommended to make a reservation in advance), or if you prefer you can bring your own picnic. Can I buy products from the Ribeira Sacra? Yes, in Castro Caldelas you can buy local products and in the winery you can buy wine if you wish. All of them are local products. The bus will have a maximum of 21 seats. The Ribeira Sacra is not a place for larger buses. What happens if I arrive late at the meeting point of departure? You will lose the ticket and it is not refundable. We recommend you to be 10 minutes before departure as we can not wait. If we do not meet the schedules, the whole group can be damaged, an example is that not getting to the boat trip on time makes it impossible to carry out this activity. Could I depart from another location? The available departures are those shown at the time of booking, but you could reach Ourense from other cities such as A Coruña, Lugo, Vigo or Santiago de Compostela by train. For this, you would have to arrive at the train station in Ourense before 10:30 am. The meeting point in Ourense is located at the train station. - Cancellation costs if any. - A penalty, consisting of 5% of the total trip if the withdrawal occurs more than 10 days and less than 15 days before the date of departure of the trip; 15% between days 3 and 10, and 25% within 48 hours prior to departure. If you do not show up at the scheduled time for departure, you will not be entitled to any refund of the amount paid, unless otherwise agreed by the parties. We use minibuses for transportation, with up to 21 seats. The goal is to offer the best experience possible to our customers, staying away from very big groups.